One of the small things in life that I take great pleasure in is heading out to the store or running an errand and bringing a few of my kids along with me. Riding in the car somewhere is a great opportunity to spend some “quality” time with your kids and can provide some great teaching moments. While riding in the car over the weekend, one of my boys started asking questions about where our family was from, which started a fairly long conversation that he really enjoyed, including a few interesting and amusing stories. My family, on my father’s side, is from West Virginia. While for many, this conjures mental images of “Deliverance”, it’s a heritage I’m very proud of. West Virginia is full of honest and hard working people, that while certainly “country”, they are also people that never forgot you and always put family and people first. Making sure I never forgot my roots is important to my Dad, and now as a father, it has become important to me as well. I clearly remember the first few months after starting Side Income Blogging. I remember checking Google Analytics daily to watch for visitors and looked forward to receiving those very first few comment notification emails. I also clearly remember starting my very first blog on personal finance in 2006, and how exited I was as I started to receive comments and interaction from readers. I remember many of their names to this day. Every single one of your readers. They are the foundation of your blog. Other bloggers that help you, write for you, support you, and link out to you. Your family who will support you and give you incredible ideas if you listen (this article is a perfect example). All of these people and moments, I refer to as “blogging roots”. Someday, when your blog is big and influential, these are the people and momenets you absolutely do not want to forget. Without these people and events, your blog would not be where it is. When I first read that, I wasn’t sure I agreed with her. But the more I thought about, the more I realized that she was right. Gone are the days of anonymous/code name bloggers. Relationships, especially those we have with our readers and our audience, are becoming more and more important. Social media has really become the icing on the cake in this trend, almost requiring people to be “real”. Readers want to know who you are, they want to see your face. There is a disturbing trend though that I’m seeing in the blogging world: Over the past few months, I’ve emailed and tried to correspond with a number of “A-list” bloggers for various reasons, and unfortunately received very few replies. A-list bloggers are the top blogging tier, they are the bloggers and blogs that come to mind when you think of high traffic blogs, large income earning blogs, and those blogs that really influence the internet. The trend I refer to is one where these blogs and bloggers start out like any other. They have people and events that spur their growth over time and help them become the big success they are. The problem is that I see these bloggers frequently forgetting where they came from and turning their backs on the people that helped get them where they are today. These bloggers are also forgetting who is keeping them where they are as well – their readers. Sure, I get that large blogs get lots of email and comments, but at the same time keeping up with email and comments has to be a priority. Unfortunately for many, it doesn’t seem to be. Sadly, making money seems to be the priority. The irony here is that it’s the blog’s readers than generate the income. Don’t believe me? Think I’m over exaggerating? Try this: Send an email to 5 really big name bloggers and ask them a thoughtful question. Send them something on social media. If more than one of them replies, I’d be surprised. If you do decide to do this, please leave a comment below and let me know your results. Feel free to call out the name of the blogger’s that did reply, because I think they need to be recognized. Not replying or recognizing a comment I added to your post. Recognizing can be “liking” or giving a “plus one”. Not engaging on a post I publish on my blog or create on social media. When was the last time you saw an “a-list” blogger share something on social media and there were lots of comments and none of them from the blogger ? Or even worse, they respond to comments, but only from comments made by other “a-list” bloggers in their clique? I had this very thing happen a few weeks ago on Google+. I responded to the blogger’s post and even asked a question. There were other comments from “a-list” bloggers than received replies, but my reply was completely ignored by all of them. I felt like I wasn’t even part of the conversation. I’ve seen all of these scenarios far too often lately and I’ve stopped following most of these bloggers too. Not just due to one instance, but due to repeated instances. This will probably hurt me some, but I refuse to support “elitest” bloggers. When was the last time an A-List blogger responded to one of your social media posts? Oh, and responding due to you sharing one of their articles doesn’t really count. 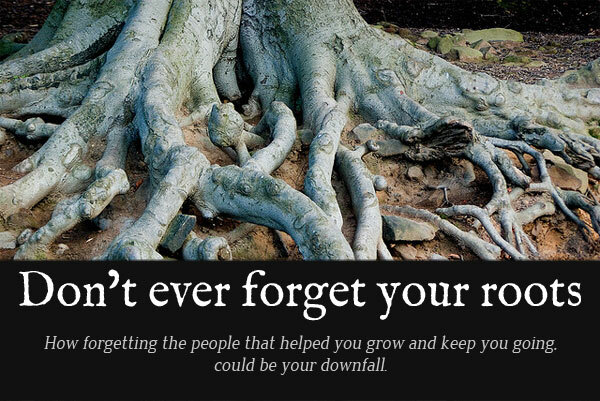 Don’t turn your back on the people that helped you grow and become successful. Don’t ever forget the people that read your blog each day and take the time out of their schedules to add a thoughtful comment on your blog and your social shares. When one of your readers takes the time out of their life to write you, respond. Those people are writing you because they respect you and nothing says “I don’t care about you” more than not responding or not giving them a little of your time. Sean Ogle of Location 180 – Sean has replied to every email I’ve sent him, and also engaged me on social media. He even proactively sent me an email! Sean is very approachable and clearly appreciates how important his readers are. Darren Rouse of ProBlogger – Darren is a name that would probably make it on the top 5 successful blogger lists of most anyone. His blogs are incredibly popular and I can’t even begin to imagine how many comments and emails he gets everyday, yet me manages to reply. I’ve exchanged a number of emails with him over the years and when I’ve mentioned him on social media, he almost always finds the time to reply. Sea and Darren are two shining examples of bloggers that haven’t forgotten their roots and understand the importance of putting their readers first. 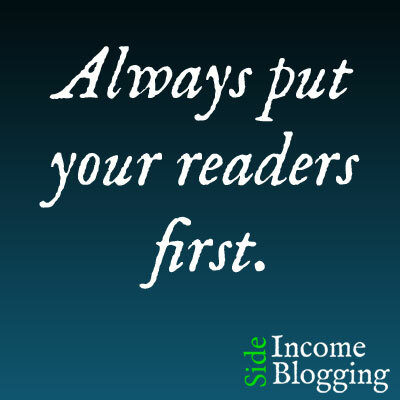 I sincerely hope that all of you reading Side Income Blogging and working to grow your blogs become huge successes. Just make sure once you’re there, that you don’t forget the people that helped you get there and the people that help you stay there. You have my word, I’ll never forget. Thanks for this, Larry, and for pointing out that it’s not good practice for A-list bloggers to ignore their readers…. I guess I just always assumed that this was the way it was supposed to be, for top bloggers. This makes me think. Keep up the good work. You definitely practice what you preach, and have really helped me get started out with blogging. As someone new to blogging, I have to say, I love your attitude. I have commented and asked questions on many blogs and rarely received replies. For some of the more popular bloggers request to use properly credited and linked quotes even go unanswered. Needless to say they are no longer on my reading list. As an aside you just made my have to read list. I’d like to give props to Chef Dennis Littley of A Culinary Journey with Chef Dennis. Always willing to help ANYONE. Thanks so much for this article, and I wholeheartedly agree. I have definitely stopped following or at least lost respect for bloggers who don’t respond to my comments or shares. Some of them are more like C-list, but they are already apparently too busy or important to reply! For example, when I praise someone’s recipe not only in a comment on their site but on my own blog, would it kill them to at least reply with a simple “Thank you”? I’m sure not to do them the favor again in the future. On another subject, I’m happy to have found your blog, and I’m looking forward to poking around and following your new articles! @Danielle – You’re welcome. I’m sure others will disagree, but that’s my take on it. If you have comments on your blog, I think you should respond. Otherwise, what’s the point really? Comments are about interaction, especially with your readers. Comments and interaction are one of the things that makes a blog. I often find I get as much or more value out of the comments than I do the article itself! As for being approachable, I sure hope so. If I ever become anything other than that, you let me know ok? If I ever become unapproachable, it’s time to move on to something else! So glad to hear I’ve helped you with your blogging and thanks so much for the kind comments. @Gregory Lovvorn – I think your statement is really sad. Back when I started blogging in 2006, one of the main reasons people visited blogs was to comment and interact with the writer. Comments were and are one of the main things that sets blogs apart from other media. To hear that you’ve left many comments and questions and rarely receive a reply, just saddens me. Really glad I made your “have to read list”, I’ll do my very best to stay on there! @Karen – I’ll second that. My interactions with him on Google+ have shown that as well. @Andi – I think the problem with “c-listers” is they are probably blogging part time, and just don’t feel like they have the time. What they do is spend that time doing other things like writing more content. I personally think it’s more important to write less content and spend more time interacting with your readers via comments and social media. Personally, I would much rather have 100 readers that interact with me frequently, than 1000 that don’t. People spend way too much time focusing on the numbers and not on the real value. It’s funny really…I receive lots of comments from people thanking me for my articles and for this blog. What people don’t realize is that I probably get more value from readers than they do from me! I learn from your comments and you give me different perspectives to consider. Most importantly, you inspire me and keep me motivated. I appreciate that. I’m glad you found my blog too. If you get the “poking around” and have any questions, just let me know! What is there left to say? I have followed you from the start of my first Blog. Actually you helped me with it in my fist email to anyone outside. Your response was fast and helpful and left me with the welcome thought that if I need to ask you anything else you would welcome my questions. Another excellent article! I am glad we shared similar Parents and Grandparents! You are the real deal Larry Dean! Thank you for being a friend to all of us needing a good start! I have to second what Charles just said…you were incredibly kind and helpful to me when I sent you an email and I am very grateful. Sadly, the same sort of thing goes on in the mummy blog genre. I must be a really naive person but I sort of had this idea that the established, successful mum bloggers would be helpful and supportive to newcomers, but I haven’t found this to be the case. I often think why do they bother asking a question at the end of their post for people to comment on when many of them can’t be bothered saying thanks or answering a question – whether they know it or not it comes across as really rude and I for one get turned off by them. Also, I approached a biggish blog to write a guest post (and emailed it to her) and instead of having the decency of just saying ‘no thanks’, she ignores me and then a week later writes a post on the exact same topic. Anyway, while being discouraging, it’s all a learning process and I’d like to think if I ever became successful I’d remember all this and encourage and support a new blogger. Hey Lynda. So glad to hear I was helpful and appreciate your kind words. I’ve heard that from others about he “Mommy” clique. I don’t think you are naive, or perhaps maybe I am as well, but they should be helpful and supportive to newcomers. I love see new bloggers. I had a few influential bloggers that helped me early on, so it’s important for me to pay that forward. That’s really sad to hear about the guest post. You are right, it’s all a learning process, and the good news is that not everyone is like that. There are some really legit and kind “influential bloggers” out there. Thanks for your comment.